Scorched brown earth, cracked and sandy ochre reminiscent of the desert. This landscape is the inspiration for GUERLAIN Terracotta, a bronzing range that has captivated since 1984. Each summer, the Terracotta range provides an instant, natural and healthy glow with ease. The range of makeup and skin care products work to enhance every aspect of your glow, from prolonging a natural tan, to faking a bronzed glow. 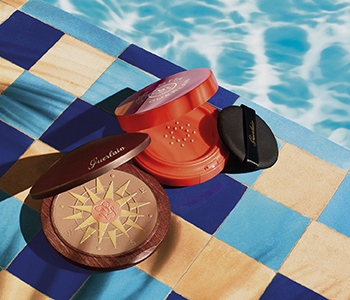 Revel in the sun all year long with GUERLAIN's classic Terracotta Bronzing Powder, enhance your tan with the Bronzing Mist, and let your finish your sunkissed look with the Terracotta Foundation, Nail Lacquer, Lipgloss, Kohl, and Glow Enhancing Perfector. With GUERLAIN's Terracotta, the sun is at your fingertips.